Well for the last 6-8 weeks I've been sharpening my shooting skills doing what I like second to fishing...shootin' steel...I like to hear things go "Clang!!" and then either swing or fall over. But that warm spell last week was amazing...those huge sheets of shore ice are almost completely gone. The water temp is still hovering around 33-34F and the water is falling but it appeared to be safe for wading...so I went out today looking for my first smallmouth of 2018. The smallies all had lockjaw (as I sort of figured they would) but I did find some action. 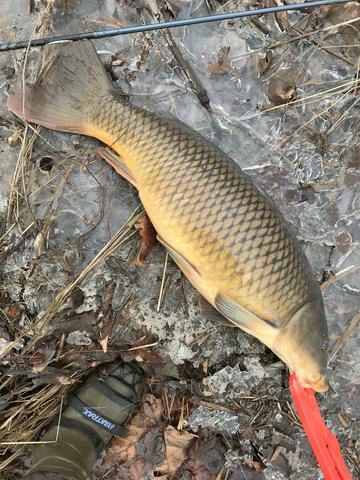 I must have foul hooked 6 carp and two of them actually sucked in my Willie Wannabee including this 25 pounder. 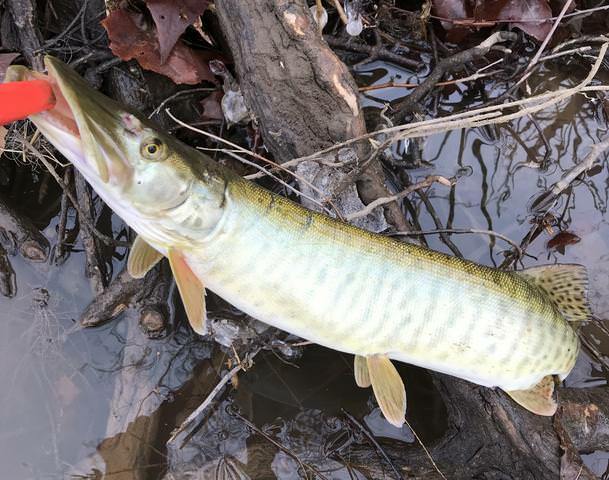 This esox (about a 30 inch muskie) kept playing with my Willie Wannabee and I was lucky enough to hook him in the top of the snout. He wound the line around his gill covers and sort of asphyxiated himself and came in pretty easily. 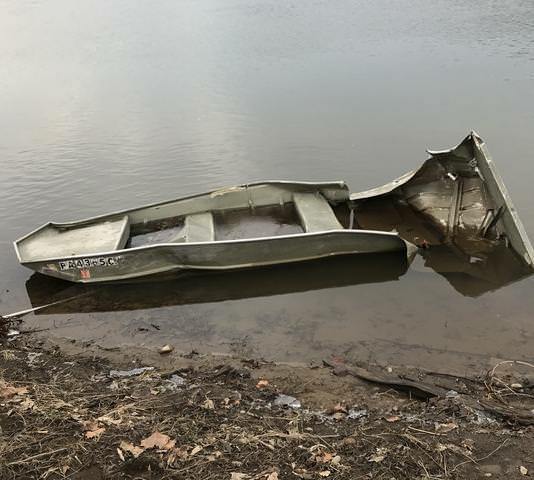 The only ice I saw was on the far east shore but this aluminum boat looked like it had a battle with all that sheet ice that filled the river recently. Felt good to be back on the water with my "woman"...Suskie-Q. I pitty that boat owner! But the fish look good again, reel good. You said about shooting steel, are you shooting any real distance? I have read about guys shooting steel at like 500 yards plus. Or is it just your standard yardages 100-300 yds? I have made it to the range 3 out of the last 3 weekends. This weekend may be out of the question, incoming weather. But the smokeless powder did smell good again. Very calming and soothing. ...You said about shooting steel, are you shooting any real distance? I have read about guys shooting steel at like 500 yards plus. Or is it just your standard yardages 100-300 yds? I have made it to the range 3 out of the last 3 weekends. This weekend may be out of the question, incoming weather. But the smokeless powder did smell good again. Very calming and soothing. In the early 90's both my wife and I shot International Handgun Metallic Silhouette (IHMSA) matches all over the state of Pennsylvania ...both big bore and small bore handgun. Big Bore metallic silhouette was shot at 50 to 200 meters and small bore from 25 to 100 meters...with open sights, no scopes or electronic sights. We also shot falling plates and bowling pins (15 yds) with both big bore and small bore pistols. The sport dwindled out in my area and I quit reloading the big bore stuff. But I recently acquired a set of IHMSA small bore, swinging silhouette targets and I have been trying to regain my edge over the last several weeks with small bore (.22) metallic silhouettes. (Much cheaper than big bore) It was something to do that I enjoyed since I couldn't get to the river. I realize how much I enjoyed the challenge and the competition. Almost as much as I enjoy a big smallmouth taking out my line. Oh I agree with the challenge. I myself enjoy a bench rest and 200-300 yards, with 1 of my rifles. More the focus on the target, causing me to forget about lifes distractions. After an hour or so of a couple shots, then walk to check the shot placement. I come home extremely relaxed, almost as much as wading the river and hearing only the river. Really enjoy shooting. But smallmouth fishing is a bit more economical also, and exciting when the drag starts running with a 3-4#er on the other end. Good to see your posts again, I look forward to them! After seeing that those ice flows can take out a bridge, that jon didn't stand a chance!